I have such high hopes for the low carb lifestyle, largely in part to your blog! I want to make all of this stuff, teeny problem is living in Oslo, Norway and lack of availibility of the fancypants natural ingredients! Do you have a list you would reccommend of must have staples for the kitchen? I’m thinking my mom can do a Whole Foods run for me and send me a care package! So, if you were living in Scandanavia, what would your care package from the states have in it?? Oh, bless you child. I am so on this one, just need to hit up the health food store. Glad you posted a new one! Kathryn – You can do it! 🙂 Check out the “ingredients info” tag on the side bar. That should direct you to the post about GF wraps that has most of the products I keep in the pantry! Email me if you have any more questions. Jeri – Thanks for the tag! Hope you enjoy the cookies. the best prices for erythritol I’ve seen. In stores, erythritol IS outrageously expensive! You could try Splenda as the primary sweetener if you don’t mind it. You have the best low carb food blog I’ve ever read – not only do you fill it with interesting nutrition information about the ingredients – you also don’t use funky stuff in your recipes. Not to mention, everything tastes incredible! I have a question about the pictures. How do you get everything to look so nice in the pictures – are you a hobby photographer as well? Thanks again for the yumminess! Whole And Natural has a large selection of organic agave nectar in raw, light and amber. I am new to the low-carb thing and had a few questions. First of all, I am mainly looking at low-carb because I am having some issues with my blood sugar. I was wondering about all the FAT in low-carb recipes that I have been looking at online. I can’t imagine eating so much fat! I was wondering if you are at a healthy weight even with eating almond flour, coconut milk etc. I have also read that it is NOT safe to go no-carb. Do you eat carbs at all? What made you want to go low-carb? Wow, these look awesome! Love the huge chocolate pieces too :). I nominated your blog for a blog award on my blog (Flour Arrangements) :). You don’t have to pass it along if you don’t want to, just thought I’d let you know that I’m a fan of your recipes and photos. Have a great weekend! Thank you so much, Sophie! I’m coming over to visit your blog asap. I will bet my life that all the food that you posted here tastes good!!!! also.. i really love your food photography… great shots! keep it up. -I didn’t have a whole lot of almond meal, so I subbed 1/2 cup ground flax seeds (great for low carb baking because they have an equal amt of fiber and carbs therefore 0 net carbs!!) and 1/2 cup soya flour in place of one cup of almond meal. – I only used 1/2 cup of erythritol and 1/2 teaspoon of xanthan gum. Lauren, I cannot tell you how AWESOME these cookies turned out! I am so excited! I LOVE erythritol! You are so right, it is a wonderful sugar sub! I cannot believe it do and how GOOD the cookies tasted!! Thank you for making my first attempt at a low carb, gluten free treat delicious! I am freezing the rest of my cookies so I won’t eat them tonight! But also, I think because of the high fiber and protein content, I was totally satisfied after eating two of them!! That is so awesome! Thankyou for your refreshingly unjudgmental stance towards splenda users. I use both splenda and natural sweeteners such as stevia in my food, and I do so with knowledge of what I am using. I love health food but occasionally its easier to use splenda instead of stevia or sugar, and I get weary of these holier than thou nature eaters condemning that. Thanks for being cool. I discovered your blog months ago and have been trying a few of your recipes. I love everything chocolate and so this website is great for that! 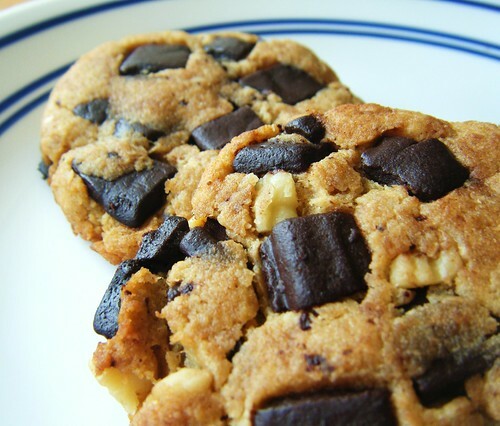 I started blogging about my lc journey 2 months ago and I did a post today about a chocolate chunk recipe and gave credits to yours. These cookies look a-mazing, but it doesn't say what to do with the xanthan gum? I'm an erythritol novice and have no idea what to do. Thanks! Just made these and they are awesome! Have been trying to figure it out on my own for a while now with only fair at best results. Thanks for figuring it out for me. Way impressed. Will try the ice creams next. I am new to your blog and absolutely love it. I cook when stressed and use many of the usualy flours like quinoa, beans and amaranth. I just found out I am severe diabetic and even unsweetened chocolate, nuts and coconut raise my sugar levels until I get it under control. Do you have a cookbook out yet with all these great recipes so I don't have to print them all. I cook for so many friends who are GF, sugar free, and even complete allergy free and love to create desserts that have great taste and texture. LOVE THIS! I'm so excited that I found this blog since my kids are full of allergies (GF/CF) and I'm trying to diet low carb. These cookies were AMAZING and we loved them! Can't wait to try the other recipes! SO THanks so much for doing what you do. Nothing like the smell of chocolate chipe cookies baking! Made these last night. I got 22 cookies out of the recipe. Would prefer them a bit sweeter but other than that very satisfied! Lauren…made these yesterday and they were amazing!! Thanks so much for this recipe, your recipes have helped me lose 50lbs. in the last year. Your pancake recipe is also fantastic!! Haven't tried this recipe yet, but I wanted to thank you for the low carb article that you posted for "Anonymous." The article was very informative and enlightening, and I shared the information with my dad. I've started eating low carb/no sugar because of Candida problems. After seeing how fired up I've become, my dad really wanted to try to eat healthier along with me, especially because of his Type 2 diabetes. Hi JamBelly, sorry to catch your comment so late! I powdered my granular E. Did you use NuNaturals pure stevia? Hehe, no problem. :3 Although my treats don't come out nearly as beautiful as yours… but I'm working on it! 😉 You're inadvertently mentoring me through your wonderful blog. Hello Anon! I would say the cookies won't be sweet enough without that amount of E. The xanthan gum might not be necessary, but I find it keeps the E from crystallizing and holds the cookies together without a sticky sweetener like real sugar. Let me know how they turn out for you! I made these tonight. I used spectrum butter flavor shortening and used 2 tsp of almond extract for 2 of the 4 tsp of vanilla extract. I also used flaxseed as an egg replacer. Freaking stupendous!! You are a cooking genius Lauren! I love the truly sugar free (or minimal as possible) approach you have. It really is hard to find. and I love that you don't use splenda as your main sweetener! Thank you for your recipes!!! 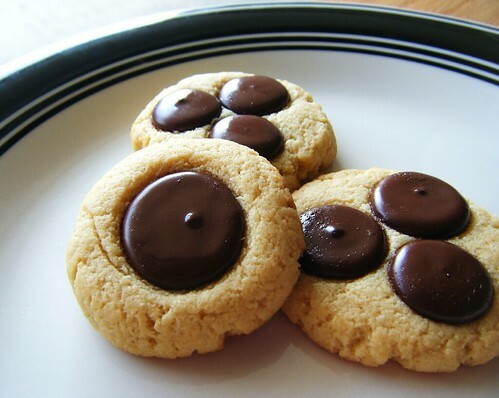 I tried to make these cookies, and I they didn't turn out. Wondering if you can help me figure out what I did wrong? Lauren, I just took the second batch out of the oven and had one from the 1st. WOW! These are wonderful. I LOVE your blog and recipes and photos! You totally rock!!! I cannot tell you how it feels to have “sweets” of my own. I am type 2 , and the only one in my family, so to say the least I am stuck in a house full of carbs. I am determined to control it with diet! All your hard work and wonderful cooking talent is a blessing to me! These cookies are so amazing!!! They are utterly delicious and don't seem to affect my blood sugar at all. I prepared the batter and rolled it into a log to store in the fridge, so I can slice and bake a few at a time. Otherwise, I would definitely go overboard! 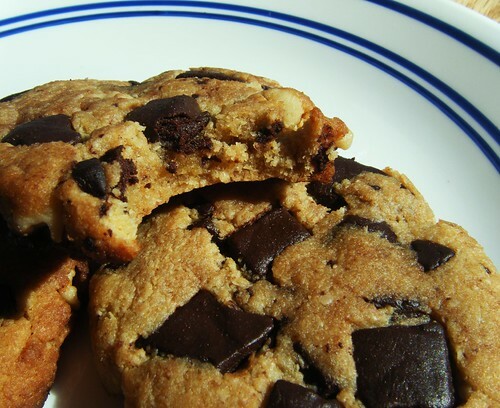 Thanks for figuring out how to make chocolate chip cookies low-carb! Also, the chocolate chunks are awesome. These look amazing!! I really want to try it out. Instead of almond flour, can you use brown rice flour? I do accept as true with all thhe concepts youu have introduced to your post. They’re really convincing and will definiteoy work. 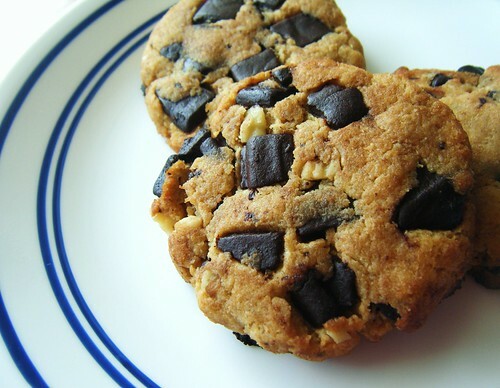 when I clicked on the link for the updated chocolate chunk recipe it just went to your website. I did not see a recipe there for home made chocolate chunks? 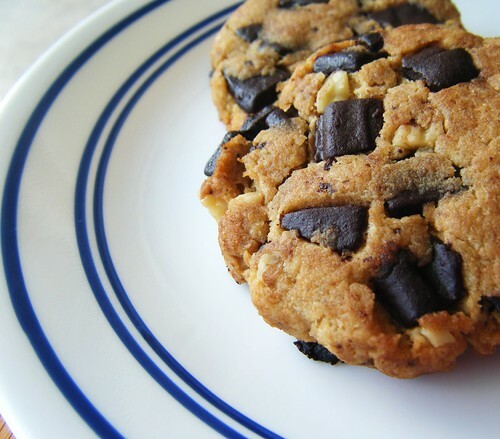 I must say I have tried several low carb chocolate chip cookie recipes and they have all been disappointing…until I tried these! thank you for a great recipe. These will be my “go to” for a cookies!